Because the best care is collaborative. [M]otherboard is where education meets collaboration and informed decision-making. 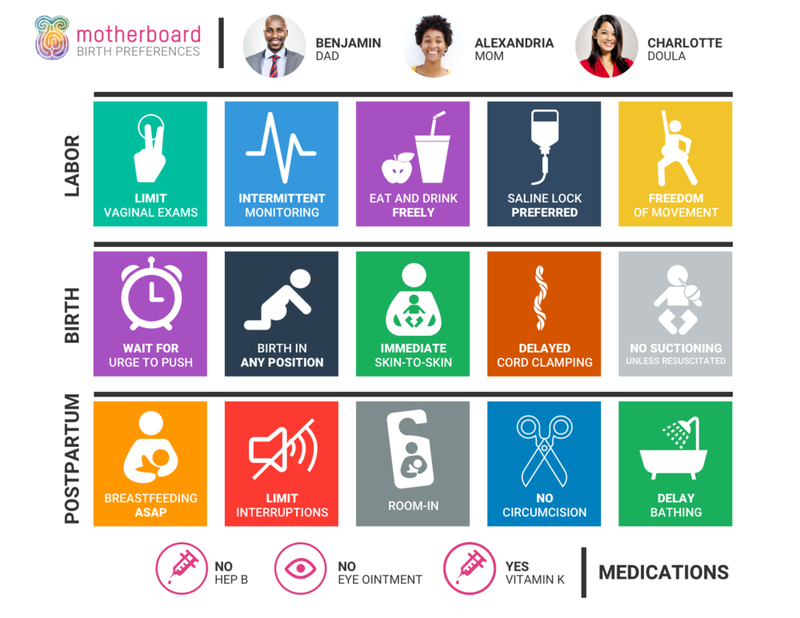 Our interactive software helps you create your personalized “[M]otherboard” (aka visual “birth plan”). Research, select, and share your preferences with your whole team, anywhere, on any device. Amy - Birthing my three daughters ignited my passion for birth. I wanted to help parents become less fearful about the birth process and feel completely supported throughout, so I became a doula. There is nothing quite like witnessing a new human come into being. It’s magic in a way that can’t be properly described. Through my doula work I’ve had the privilege to support families in all sorts of situations: hospitals, birth centers, home births, with midwives and doctors, water births, VBACs, cesareans… I often saw parents struggling to have their needs understood in a complex and hierarchical hospital system. I met Andy in 2013 when he and his partner Jen hired me to be their doula for their first birth. Andy, a graphic designer, created the first [M]otherboard for his own birth. The hospital staff was instantly thrilled! Finally, a way to take in a family’s birth preferences in a bright, easy way! We knew we were onto something. We are so excited to launch [M]otherboard to the world Nov 5, 2018! We are currently looking for care providers and hospitals to partner with to bring our software to their patients. Access all the [M]otherboard Birth Content and use our interactive software and build your own [M]otherboard!